BRANSON, Mo. 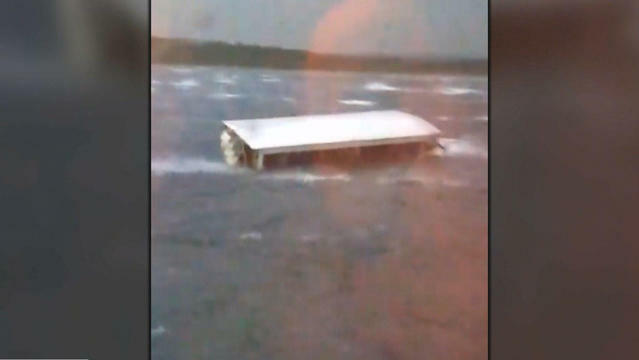 -- Seventeen people were killed when a duck boat packed with tourists capsized and sank in high winds on a Missouri lake overnight, Stone County Sheriff Doug Rader announced on social media Friday. The driver of the Ride the Ducks boat died but the captain survived when the boat sank Thursday night in Table Rock Lake in the Branson area, Rader said earlier at a press conference. Authorities blamed stormy weather for the accident. Winds at the time were blowing as hard as 65 mph, according to the National Weather Service. Fourteen people survived, including seven who were injured when the boat went down, state police said. Missouri State Highway Patrol Sgt. Jason Pace said those who died ranged in age from 1 to 70 years old. Jim Pattison Jr., the president of Ripley Entertainment, which owns the duck boat tour company involved in the incident, told "CBS This Morning" on Friday the boat "shouldn't have been in the water." "I don't have all the details, but to answer your question, no, it shouldn't have been in the water if, if what happened, happened," he said when asked why the tour continued in such rough conditions. Pattison said the duck boat had life jackets onboard but Missouri law doesn't require people to wear them. "Usually the lake is very placid, and it's not a long tour," Pattison said. "They go in and kind of around an island and back, and we had other boats in the water earlier, and it had been a very sort of calm experience up until this came very suddenly." Authorities were working to determine what happened and had no information about whether passengers were wearing life jackets or whether they were just stowed onboard, Rader said. The sheriff said authorities plan to recover the boat later Friday. Rader said that he believes the boat sank in 40 feet of water and rolled into 80 feet of water. He said state police divers have located the vessel, which is on its wheels in the lake. Duck boats, named for their ability to travel on land and in water, have been involved in other deadly incidents in the past. Five college students were killed in 2015 in Seattle when a duck boat collided with a bus, and 13 people died in 1999 when a boat sank near Hot Springs, Arkansas. Rader said the first call about the capsized boat came in at 7:09 p.m.
Rader said an off-duty deputy working security for the boat company helped rescue people after the boat turned over. Dive teams from several law enforcement agencies assisted in the effort. Suzanne Smagala with Ripley Entertainment said the company was assisting authorities. She said this was the ride's only accident in more than 40 years of operation. A severe thunderstorm warning had been issued for Branson at 6:32 p.m. Thursday, before the boat tipped over. President Trump expressed his condolences on Twitter. "My deepest sympathies to the families and friends of those involved in the terrible boat accident which just took place in Missouri," the president said. "Such a tragedy, such a great loss. May God be with you all!" Branson, about 200 miles southeast of Kansas City, is a popular vacation spot, offering entertainment ranging from theme parks to live music.